The New York Times reported (yes, reg. req.) last week that New York’s Metropolitan Transit Authority is scrambling to enforce trademark rights in its wide array of iconography, including the famous alphanumeric train symbols known to all New Yorkers. Evidently powered by the MTA’s burgeoning licensing program, it’s not a bad idea. No question but that these and the many other powerful symbols used by the transit system are excellent communicators of source, quality and all those other trademarky things. The New York transit system, especially the subway, is an entire subculture unto itself. In other words, don’t be surprised if there’s some pushback on this new, and somewhat belated, attempt to kind of privatize, or revenue-ize, a world that generations of people think of as “everybody’s” property. Of course, the libertarians remind us constantly, and accurately, that when something is everyone’s property, it is ultimately treated like no one’s property at all — which “everyone” ends up paying for. Still and all, there is an interesting trademark policy issue in here somewhere. It’s one thing to say that services aren’t free and that even when, as in the case of the MTA, they succesfully address significant externalities, their costs should not be unduly disconnected from users. But it’s another thing to say that, however revenue-starved, a public institution (in the broad sense of the word) such as the MTA should restrict the public, much less the bloggy, enjoyment of a public iconography such as the train number symbols and the image of the classic subway token. The numbering system has been around for what, 100 years or so? 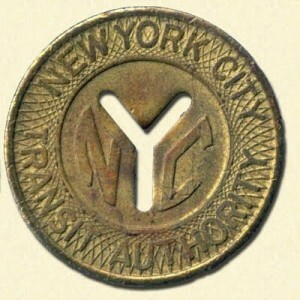 Has the MTA claimed trademark or copyright status before> Can they now do so post facto? I’d be interested in the law on this. I was also struck by the similarity between the MTA number logos and a system that a company called “Bottling Development Inc” has been offering for years for machinery identification. Again, since they have been using it for at least 20 years that I am aware of, could MTA take it way if they have not previously complained?